Today’s economic warfare is not the kind waged a century ago between labor and its industrial employers. Finance has moved to capture the economy at large, industry and mining, public infrastructure (via privatization) and now even the educational system. (At over $1 trillion, U.S. student loan debt came to exceed credit-card debt in 2012.) The weapon in this financial warfare is no larger military force. The tactic is to load economies (governments, companies and families) with debt, siphon off their income as debt service and then foreclose when debtors lack the means to pay. Indebting government gives creditors a lever to pry away land, public infrastructure and other property in the public domain. Indebting companies enables creditors to seize employee pension savings. And indebting labor means that it no longer is necessary to hire strikebreakers to attack union organizers and strikers. What is truly astonishing about this situation is the nature of contemporary finance capital. In essence, it is functionless. It does not exist to generate capital for investment in the real economy. It does not provide safe storage for pension funds, insurance monies, personal savings, etc. It does not even provide the common investor with rational investment programs. Rather, finance capital today is just a system specific mechanism (or, better, set of mechanisms) which extracts massive quantities of wealth from the world. Profit taking — that is its sole purpose. Moreover, it is omnivorous and perpetually famished. It cannot be satiated. Its appetites thus put everyone at risk. It lacks a home, a national identity. It cares not for people, their cultures, societies and well-being. It is everywhere and nowhere. It is, in a word, the vampire about which so many Americans fantasize. This pro-austerity mythology [which animates orthodox economics and economic policy in the United States and elsewhere] aims to distract the public from asking why peacetime governments can’t simply print the money they need. Given the option of printing money instead of levying taxes, why do politicians only create new spending power for the purpose of waging war and destroying property, not to build or repair bridges, roads and other public infrastructure? Why should the government tax employees for future retirement payouts, but not Wall Street for similar user fees and financial insurance to build up a fund to pay for future bank over-lending crises? For that matter, why doesn’t the U.S. Government print the money to pay for Social Security and medical care, just as it created new debt for the $13 trillion post-2008 bank bailout? The answer to these questions: Banks and other financial institutions want to keep as much of their income as they can. Transaction fees, regulations, oversight, taxes, etc. — these consume profits. America’s banks want to transfer these costs to others, namely, to those individuals who lack the political power to defend their standard of living. This cost transfer project amounts to a hidden and sometimes obvious tax the government levies on the 99%. When coupled to a system of risky and fraudulent financial transactions, elite looting and private debt creation, this cost transfer project amounts to little more than a predatory political economy. The ridiculous fiscal cliff debate which now dominates America’s public life is but a crude expression of this predatory political economy. 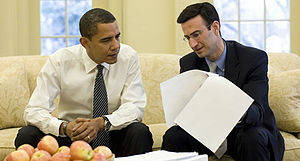 President Barack Obama and OMB director Peter Orszag. The Obama victory was less than 24 hours old when the Rubinite faction of the Democratic party was out full bore selling “reforming” Social Security as the adult solution to the coming budget impasse, giving it higher priority than any other measure on the table while simultaneously admitting that this is not even a pressing (let alone real) problem. And the worse is that this snakeoil salesmanship, which comes from former OMB director, now Citigrgoup vice chairman of corporate and investment banking Peter Orszag, is almost certainly an Obama trial balloon. It’s no secret that Obama has long viewed cutting, whoops, “reforming” Social Security and Medicare, as one of his fondest goals. He made that clear shortly before he was inaugurated, in a dinner with conservatives hosted by George Will. He even volunteered in the debates that he and Romney were on the same page as far as these programs were concerned. So it’s reasonable to view Orszag as fronting for the Administration. Orszag’s Bloomberg piece is simply putrid. It starts out praising Obama for discipline during his campaign and insisting he need to show discipline on the budget front. But this is already a rhetorical bait and switch. Now it’s outside the scope of this article to address long form, but we will stop to remind readers that the budget hysteria is completely, utterly misguided. The last thing this economy needs is austerity. James Galbraith characterized this kind of political work as economic predation. And it is just that. Fractions of big capital seek to capture sitting governments in order to use the power of the federal state to extract rents from the people as a whole. This rent-seeking politics long ago generated a complex system that persists — that retains a distinctive identity — through time. Sheldon Wolin identified this political system as an inverted totalitarianism, a democracy without citizens, a political system that serves the general and specific ends of the profit taking corporation. Barack Obama is an agent of this system. Some of his supporters might be shocked to learn that he wants to cut Social Security and Medicare, that he will not seek peace or implement a peacetime army, that he will cut deals with the Republicans that harms the interests of the majority of Americans. This is what lesser evil voting in America brings into being — evil.